Incremental growth in strip-till equipment and flexibility with fall fertilizer applications evolves Illinois strip-tiller’s operation. After nearly 25 years of strip-tilling, Emden, Ill., farmer J.T. Hayes considers the practice second nature. But that doesn’t mean he’s completely content with his system. Hayes is always looking to improve. 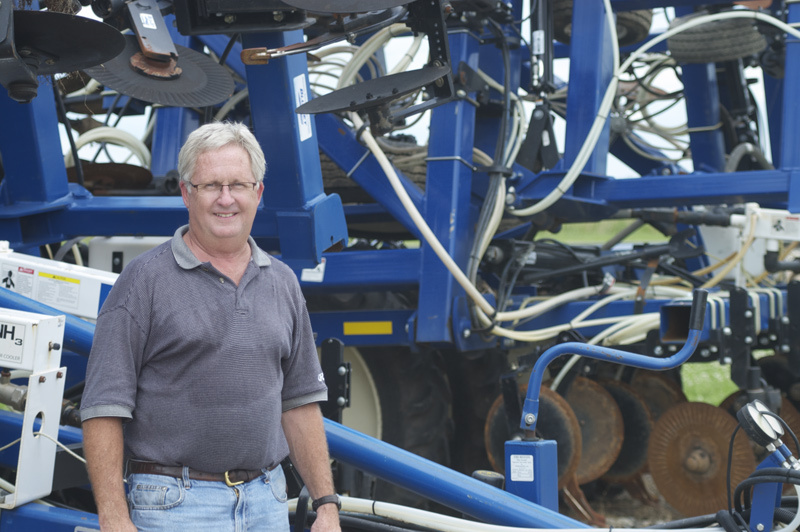 Throughout the years, he’s increased the size of his strip-till rigs to boost efficiency in the field, and through trial and error he’s tried to pinpoint the best time and method for fertilizer application in the fall. Hayes now strip-tills about 800 acres of corn on his farm in central Illinois, including between 130 to 260 acres of irrigated corn-on-corn, and he still no-tills about 800 acres of soybeans. Hayes started out with a 12-row DMI strip-till unit that he rented from a local farm service — Ag-Land FS — with the intention of starting small with the new practice. At the time, Hayes was farming alone and didn’t want to invest in a new rig. RENT CONTROL. Since starting with strip-till nearly 25 years ago, J.T. Hayes, of Emden, Ill., has taken an economical approach to the practice, renting strip-till rigs and other farm equipment, when it’s needed. Hayes eventually partnered with another farmer and upgraded to a 16-row DMI unit, and 2 years ago they moved to a 24-row Thurston Mfg./Blu-Jet 6020 strip-till rig with mole knives. The progression has allowed Hayes to cover more acres in less time — a combination, he says, is critical to get strips built in optimal conditions. TARGET APPLICATION. J.T. Hayes prefers to build his strips in the fall and apply 140 to 180 pounds per acre of anhydrous ammonia in the strip with the mole knife on his 24-row Thurston Mfg./Blu-Jet 6020 strip-till rig. Ag-Land Farm Service also broadcasts or variable-rates phosphorous, potassium and ag lime in the fall to limit spring fertilizer applications. As with the 12- and 16-row units, he rents the 24-row rig. But one of his initial concerns when moving to the larger bar was finding enough horsepower to pull it. One of the benefits of leasing is that Hayes can utilize the latest precision farming tools in his operation, and he’s used an Ag Leader RTK receiver mounted on the tractor to accurately build strips about 6 inches deep and 10 inches wide. 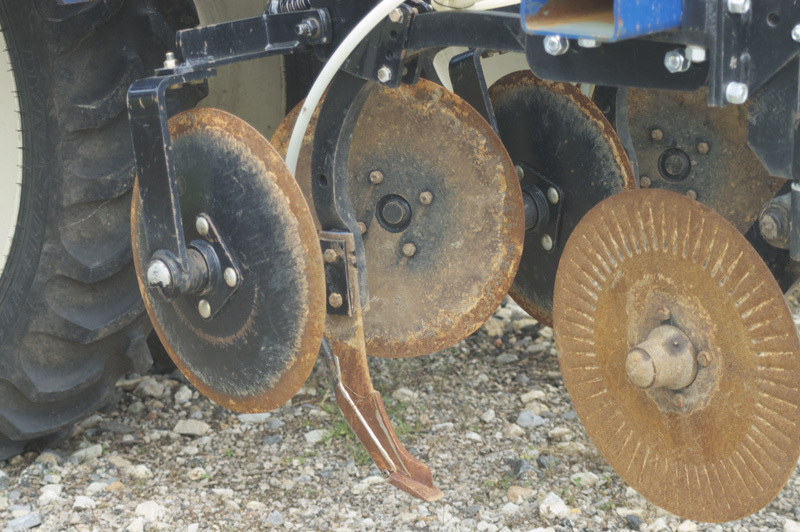 While he’s had used row cleaners in the past, Hayes didn’t include them on the 24-row strip-till unit to save costs. He instead chose to rent a vertical-tillage tool. Hayes doesn’t plan on purchasing his own strip-till rig anytime soon, but he is adamant about making sure his strips get built and his anhydrous is applied at the right time in the fall. Several years ago, he learned a valuable lesson about trying to get into the field too early after harvest. He applied his typical 140 to 180 pounds per acre of anhydrous, and planted into the strip the following spring, but noticed some unusual results with corn plants that emerged in lower-lying fields. BIGGER IS BETTER. After starting with a 12-row DMI strip-till rig, J.T. 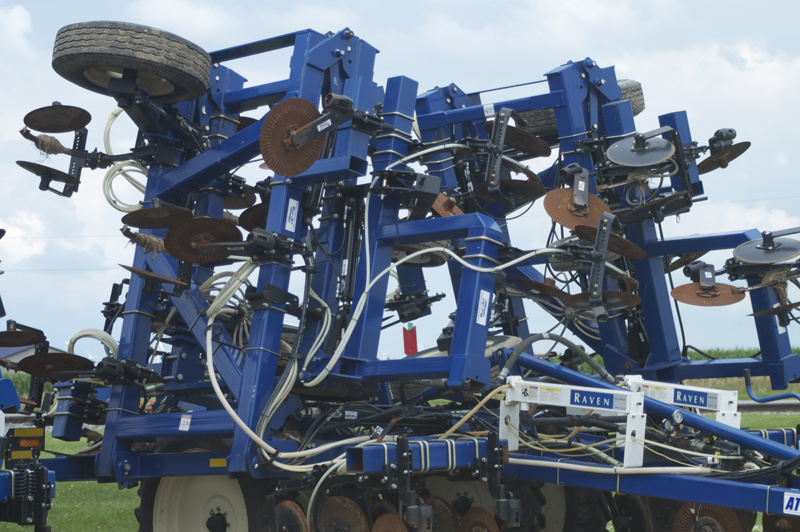 Hayes moved to a 16-row DMI unit and then 2 years ago started using a 24-row Thurston Mfg./Blu-Jet unit to cover more acres in less time and take advantage of optimal conditions in the fall to build his strips. His agronomist came out and said it was anhydrous burn. “I told him, ‘I don’t think so,’ but we took a closer look. When the knife went through, it slit the soil, smeared the sidewalls and made a little cave that trapped all the anhydrous,” Hayes says. “When my roots penetrated that cave, they got burned. While Hayes is especially conscious of field conditions when he strip-tills, he’s become more vigilant with monitoring fertilizer application. Ag-Land typically broadcasts 150 to 200 pounds per acre of potassium and phosphorous in the fall, along with 1 to 2 tons of ag lime. But depending on soil tests, they’ve also been variable-rate applied. “If my fields are out of whack and the soil tests reveal significant variation, then I’ll tend to variable-rate because there’s going to be some economic savings from scaling back in areas that don’t need as much,” Hayes says. “Not over applying is our biggest thing. In spring, Ag-Land will apply 30 to 40 units of 28%, depending on how much anhydrous Hayes injected into the fall strip. He doesn’t apply any fertilizer with his John Deere 24-row 1770 planter, and has found that applying starter tended to slow down planting. Overall, he’s been able to shave a few pounds per acre of nitrogen application, and also seen improvement in soil structure, earthworm activity and organic matter, which has made strip-till a worthwhile practice. But Hayes says he’s looking to fine-tune his fertility program further to increase the benefits.